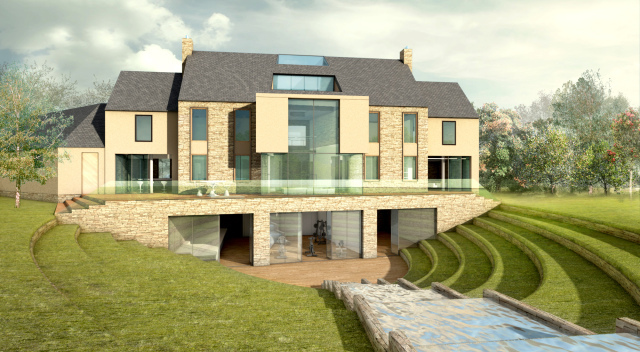 Work has begun on-site for a high-end home in an attractive area in north of England. The five-bedroom residence will combine energy-saving technology with top-of-the-range luxury living. The four-storey home, featuring a sizeable basement, will include a home cinema, games room, dressing room and jacuzzi in its 7,000sqft of living space. Clad in Ashlar stone and designed to meet CfSH Level 4, this opulent home will boast high-performance double-glazing, natural ventilation, under floor heating and Photovoltaic solar slates. The landscaped garden includes stone and lawned stepped terraces, reminiscent of an amphitheatre, with an attractive water feature cascading down its centre.